NEW DELHI — Two women, accompanied by plainclothes police officers under the cover of darkness early on Wednesday morning, entered a centuries-old Hindu shrine in southern India that has long barred women of childbearing age. Their effort was part of a continuing push for women’s equality in the country. In response, protests broke out around Kerala, the state where the shrine, the Sabarimala Temple, is located. According to local news reports, the police moved relatives of one of the women who entered the temple into a safe house. When news broke that the women had made it inside the temple, a Hindu priest shut down the complex for “purification rituals,” which typically occur when blood is spilled or children accidentally urinate. Several dozen women have tried to enter the temple since October, after India’s Supreme Court ruled that the ban on women of childbearing age was unconstitutional. But none made it inside as thousands of protesters blocked the temple’s entrance. 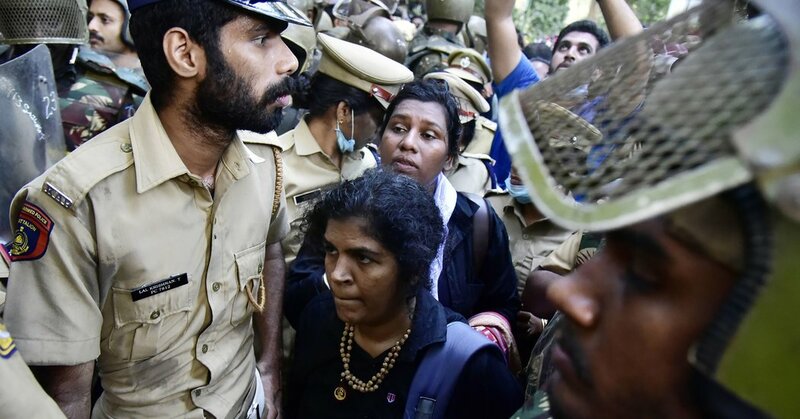 In the hours before the two women entered the temple on Wednesday, the Communist Party of India, which governs Kerala, organized other demonstrations — partly about access to the temple but also as a broad opportunity, organizers said, to highlight gender equality in a country recently named the world’s most dangerous for women. On New Year’s Day, a “human chain” — a frequent form of protest in India — stood shoulder to shoulder along highways in southern India, creating a wall 300 miles long, according to party officials. Communist Party said 5.5 million people were in that chain. The local police authorities estimated the number at three million. In the fall, India’s nascent #MeToo movement suddenly jolted forward. Dozens of women in cities posted graphic stories on social media of sexual assault and harassment by public figures in journalism, entertainment, the arts and the highest levels of government. Their protests were unusually successful, and many of the accused men resigned. In Kerala, after the women entered the temple, protesters forced shops to close, blocked traffic, pelted stones at the police, who fired tear gas canisters, and vandalized a government office in one district. At least a few police officers were injured, according to local media reports. The backgrounds of those forming the human wall were mixed, participants said. Women came in saris, burqas, nuns’ habits and jeans. Men joined as well. Participants raised their arms with clenched fists. Some talked about increasing quotas for women in government posts and improving access for Dalits, low-caste Indians once known as untouchables. In some areas, participants said, crowds swelled to such an extent that people had to form rows several people deep. Though Kerala’s development measures are better than most Indian states — attributable to higher levels of education and literacy — many participants were realistic about the challenges women face across the country. Members of India’s governing Bharatiya Janata Party, which is center-right but has ties to Hindu nationalist groups, called news of the women’s entry into the temple a “black day.” Other parties also protested, demanding the resignation of top officials in Kerala. B. Gopalakrishnan, a B.J.P. spokesman in Kerala, said that some women joining the wall had been forced to attend. His cousin’s employer, he said, had told her that if she did not participate in the protest, she would lose work opportunities. He also said some people had been bribed. “This is not a woman’s wall — it is a compulsion wall,” he said. The last 24 hours offered a peek at a more inclusive year, Ms. Sethi said.